It’s Tuesday March 10 and it’s exactly 14 days until I see the the surgeon, Matt Lyons. On that day I should be able to weight bear. (hopefully). I’ve spent days studying all the literature on tibial plateau fractures. It’s a month since I had surgery. 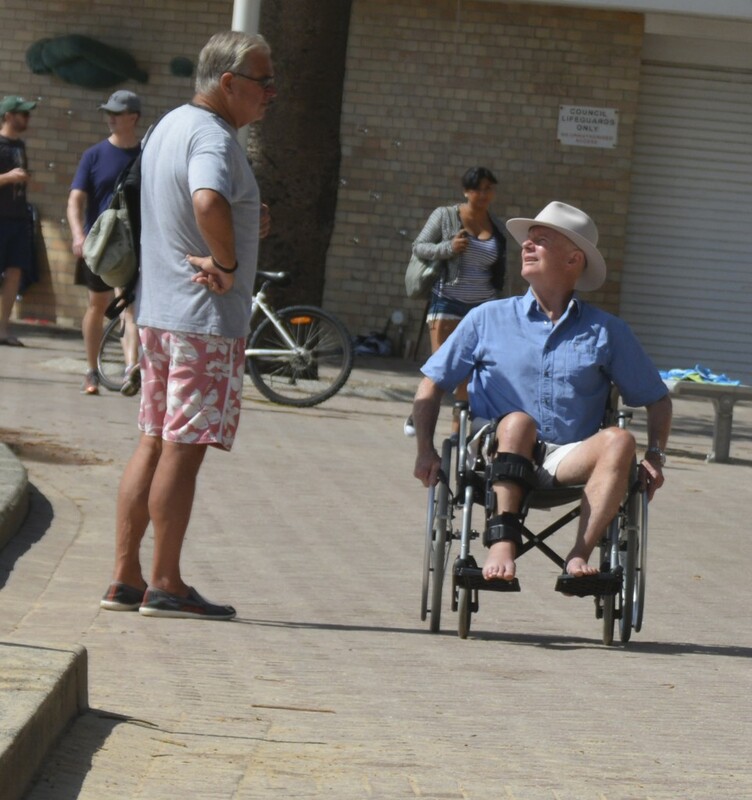 I had to see the physio this morning in Manly. I called Manly Cabs and stood for ¾ of an hour on one leg outside my apartment. The cab never came and I was frantically trying to reorganise the appointment while I stood there. It was very stressful. In desperation I started hitching. The cars just cruised by, some looked curiously at a guy standing on one leg on the roadside with his thumb out. Bit mortifying. They just looked and kept driving. I haven’t hitched a ride for about 35 years. Finally someone took pity on me and stopped. The driver was Hugh Treharne’s wife. They are a famous yachting family and own a local marina Treharne Moorings on Sydney harbour. She gave me a lift all the way down to Manly. I said she was a real Christian. I meant it. It was awful being stranded by the side of the road, standing on one leg with a pair of crutches. Mrs Treharne, God loves you and so do I. Dave Sheppard gave my leg a good stretch and massage. The massage felt really terrific. I asked him if he thought the swelling meant I had a DVT. He said he doesn’t think so. I hope he’s right because I’m not so sure. Used the crutches to come all the way back to the apartment. I had to stop three times, including coffee at Hemingway’s. At least I didn’t spill it this time. The crutches are very tiring. My shoulders are starting to get really sore. My foot and leg are still red and really swollen from the edema but Dave seems to think I’m progressing well. Bob Johnson the president of the Balmoral Beach Club came over and took me for a walk this afternoon. I had to go in the wheelchair. My shoulders were too sore. Catherine came over tonight to tell me that she has to have the meniscus in her damaged knee repaired. They think this is why she had a sore knee when we were skiing in Japan. Looks like she has made a decision to have the plate out of her leg. It’s lonely here now at night when I’m by myself. A lot of the visits are stopping and no one is coming over. Bob was the first for awhile. Also getting a bit bored sitting on my park bench watching the ocean. It was a beautiful day so I shouldn’t complain.